Today we continue our march through the row of personal system preferences with a long look at the Language & Text preference. 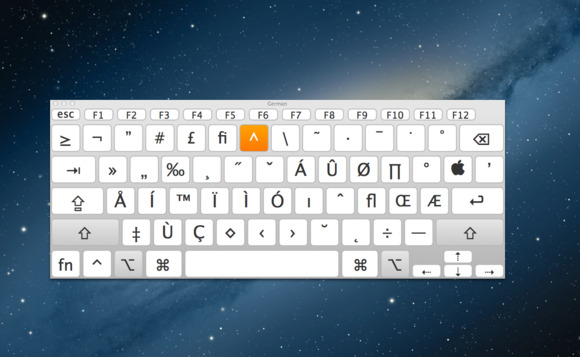 As its name implies, within it you’ll find several settings for configuring the language your Mac and Mac’s keyboard use, spelling options, text substitutions, and formatting based on geographical region. These features are available via four tabs. Let’s make our way forward. Comfortable as the Mac appears to be with the language you natively speak, it’s actually a citizen of the world in regard to language support. It supports dozens of languages as well as a smattering of variations among specific languages (British, Australian, Canadian, and United States English, for example). You find these languages in this first tab. Here you have the option to sort languages in the order you prefer. In the United States, you’ll find English as the first entry. 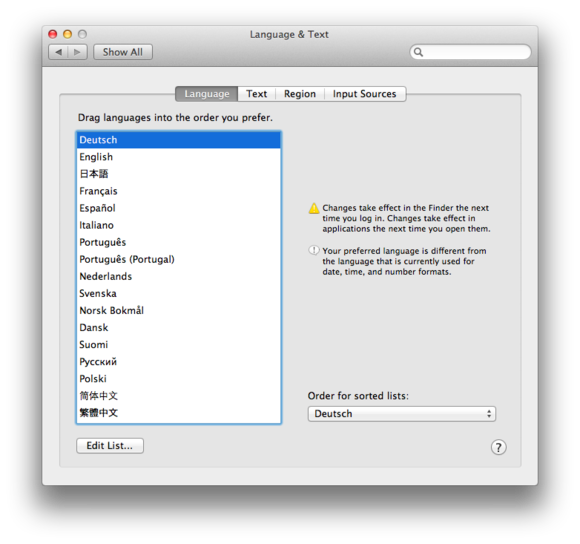 If you’d prefer that your Mac use a different primary language, simply drag its name to the top of the language list. When you change languages, the Finder will use the new language after you log out and then log back into your account. If an application is capable of using the new language, it will do so the next time you launch it. So, in this case, you needn’t log out. If an application doesn’t support the first language you’ve chosen, it will try the next language in the list. If that one doesn’t work, on to the next language until a compatible language is found. This is helpful for those who read and write more than one language and one of those languages is less commonly used. If you don’t find the language you need in the list, click the Edit List button at the bottom of the window. A sheet appears that contains a load of languages (many of which you likely didn’t know existed). To add one of these languages to the main list, just tick the checkbox next to it and click OK. You can then drag that language to the top of the list, if you like. Finally, you can choose the sort order of lists based on the traditions of a particular language. You can also choose sorting variations for certain languages—Sinhala and Sinhala (Dictionary Sort Order), for example. Just click the 'Order for sorted lists' pop-up menu to choose the sorting language. As much fun as it is to read these words, let’s do something a bit more interactive. Launch the Notes application, type (c)—complete with the parentheses—and press the space bar. Wow, your Mac just swapped in the true-blue copyright symbol ( © ) for those three characters you typed. Return to the the Language & Text window and you’ll see why. The first substitution in the list says that (c) should be replaced with ©. Likewise, TM becomes ™. And if you care to enable them, the big ol’ fractions you type become smaller and more elegant. This is cool enough on its own, but cooler still is that you can create text substitutions of your own. Let’s give it a try. 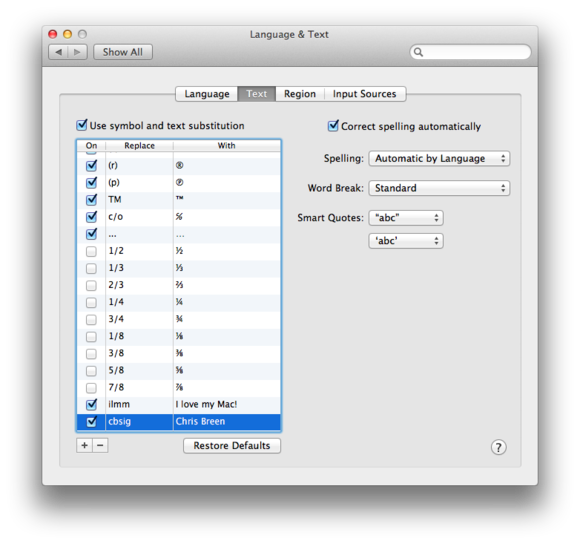 You can also choose conventions for word breaks—Standard, English (United States, Computer), Finnish, Greek, or Japanese. And, from their respective menus, you can choose which characters will be used for double and single smart quotes. As you travel around the world, you discover that citizens of other nations do not format dates, times, and numbers as you do in your home country. Of course their currency is also different. And few countries use anything other than the metric system for measurements. 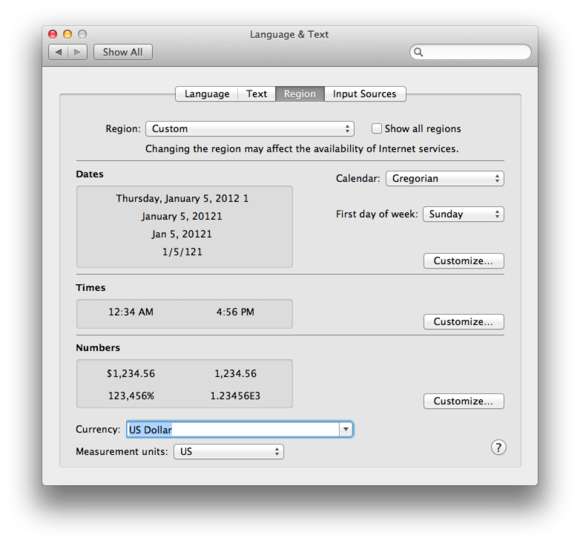 It’s within the Region tab that you can control how your Mac displays this kind of information. Near the top of the window, you’ll spy the Region pop-up menu. 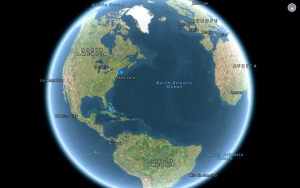 Your Mac should display your home region—United States, in my case. When you choose a different region—United Kingdom, for example—the dates, times, numbers, currency, and measurement units entries change below. These entries will be reflected in any applications that display this sort of information—the Finder, Calendar, and Mail, among them. If you want to see more regions, enable the 'Show all regions option' and click the Region menu. You’ll see dozens of additional regions, some of which offer variations. But you needn’t stick strictly to these templates. 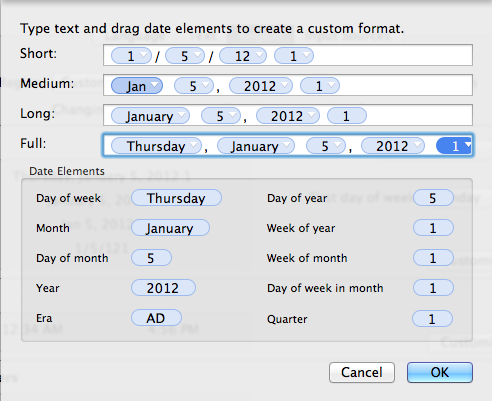 If you choose to, you can customize how dates, times, and numbers are displayed within your region. For example, suppose you’re an American who prefers the way much of the rest of the world displays the date—5 January 2012 (5/01/2012) rather than January 5, 2012 (1/5/12). 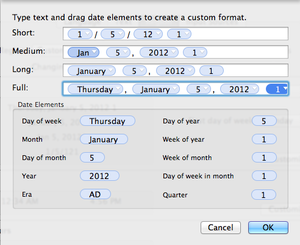 Click the Customize button in the window’s Dates area and in the Short, Medium, Long, and Full fields, drag the date entry so that it appears before the month—5/1/12 appears instead of 1/5/12. You can customize these fields further by dragging other entries to them. For example, if you want to add the week of the year so that it appears when you click on the menu bar’s clock entry, just drag the 'Week of Year' bubble to the end of the entry that appears in the Full field. Click OK and when you then click on the menu bar clock, you’ll see something like 'Friday, January 11, 2013 2' (as January 11th is part of the year’s second week). When you make this kind of alteration, the Region pop-up menu will change to read Custom.